Bible school is a part-time course and runs every Monday nigh from September to June. It is designed to equip believers with the word of God and to provide ministry training that will give spiritual and practical tools needed to be effective in life and in a ministry calling. Many are called but few make the choice to follow that calling. This course is for those who recognise the call of God upon their live and want to follow that call. Every Christian has a role and a function in the body of Christ; it may not be full-time ministry. We teach how to apply the disciplines of the word of God to your personal life as well as in your calling. Rightly divide the Word of God. Grow in the knowledge of our Lord and Saviour Jesus Christ. Become successful Christians in their own right. Use the knowledge they have gained to disciple others. Equip believers to become successful ministers of God. Disciplined prayer and fellowship time with God. In depth teaching from the word of God. Practical hands on training and service in the local church. Field training through outreach and mission programs. 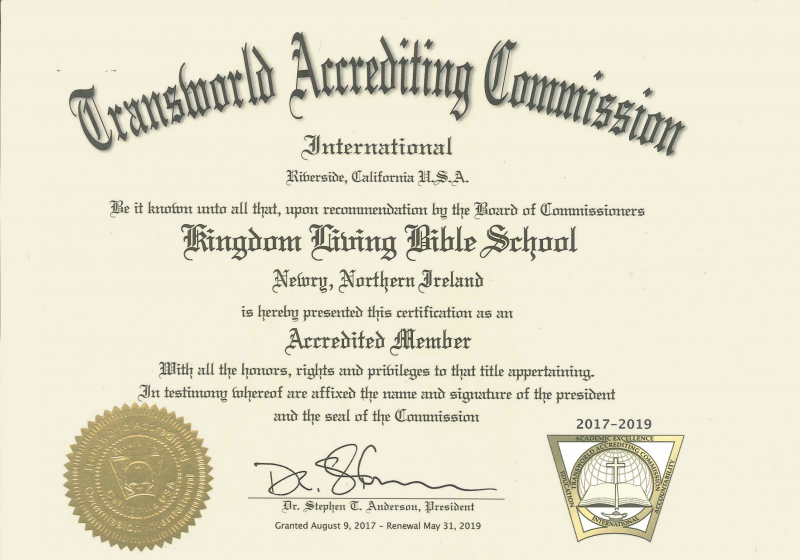 In 2017, Newry Christian Centre Kingdom Living Bible School attained Full Accreditation from Transworld Accrediting Commission. Dr Steve Anderson (Transworld President) personally attended NCC to present Pastor Mike Holohan with this prestigious award.